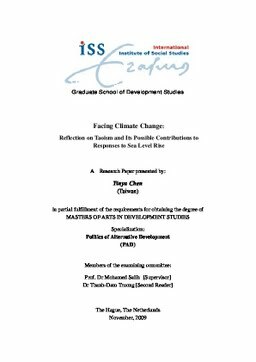 This research paper provides an innovative view of the responses to today’s rising sea levels suggesting that we require holistic thinking and actions involving multiple paradigms of knowledge and addressing a variety of layers of practices in the social system. This research explores how a holistic approach such as Taoism can be applied to the field of water management as a response to the rising sea level. This will be addressed through a comparative analysis of the policies dealing with the crisis of rising sea levels in the Netherlands and Taiwan, respectively. In order to do so, I would suggest to create a new space for dialogue between the western and the eastern philosophies embedded in the policies in order to promote multi-culture learning.